There are number of great places in New York to get a banh mi -- the iconic (and often affordable) Vietnamese sandwich -- and most of them are concentrated in Downtown Manhattan. Two of the most popular, Saigon Vietnamese Sandwich and Banh Mi Saigon, happen to be just a block and a half from each other, in that weird in-between area that's not quite Chinatown, not quite Nolita. The most noticeable difference between them? Banh Mi Saigon has a small jewelry stand up front, and Saigon Vietnamese Sandwich makes a better banh mi. Of the several banh mi options here, the one to order is the $5.50 Pate Supreme, which comes on a crisp, sesame seed-covered baguette that cuts up the roof of your mouth only a little, and opens to a fluffy center that soaks up some of the more mop-up-able ingredients. 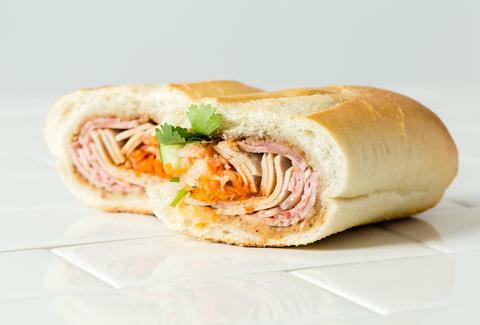 The creamy pate provides a smooth base for the layers of salty, rich cha lua (Vietnamese pork roll) and thit nguoi (ham), which get topped off with sweet, crunchy carrot matchsticks, bitter shards of daikon, and cilantro. If you’re okay with some spice, the chili paste keeps the heat to a comfortable level and doesn’t overwhelm the other flavors so much as tie them all together. Ask the super-friendly staff for your sandwich to-go, and spend your wait time (which is often minimal) engaging in the fairly magnificent people-watching opportunities this place affords. The other folks waiting for their lunch orders are always an entertainingly disparate crowd, drawn together by their love of New York's best banh mi (even if it doesn't come with a silver bracelet). Jess Novak is a Cities Editor at Thrillist, and will occasionally deviate from her strict diet of street meat for a sandwich made of ever-so-slightly-off-the-street meat. Follow her on Twitter and Instagram.